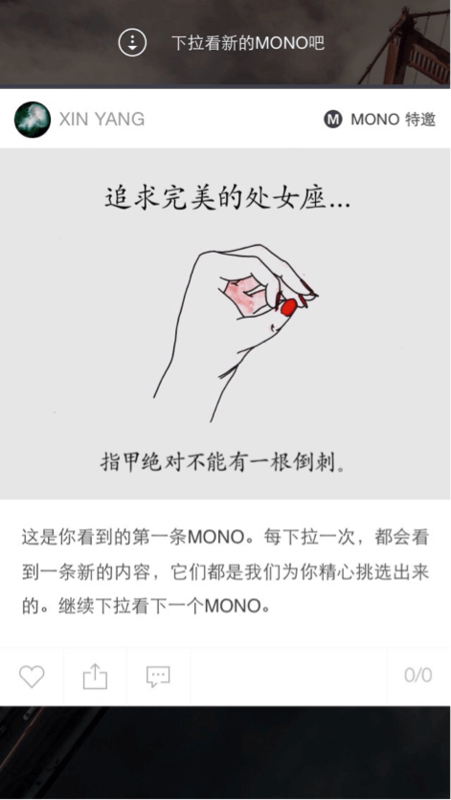 Yu Xiang Fei, a highly experienced UI designer previously working at Douban, has teamed up with two other former Douban designers to form a nine-man team to launch a new media platform aimed at curating content – Mono. The Beijing-born Yu is a graduate of the University of the Arts London with a Masters in Graphic Design. During this period, he taught himself computer programming. Upon his return to China, he worked for two years in Shanghai on UI and front-end developments projects. His career then took him to Douban where in his capacity as product designer, he released Douban Yuedu (豆瓣阅读), Douban Guangbo (豆瓣广播), Douban Banshuo (豆瓣说), Douban Biji (豆瓣笔记) and other products. However, the repetitive work lifestyle caught up with Yu and he left Douban. As someone who is passionate about magazines and counts Ming Ri Feng Shang (明日风尚) and other lifestyle and design magazines like Monocle as his favourites, it is not a surprise that Yu would find his next career move there. Shortly after leaving Douban, Yu realized that while the medium of presenting premium content was changing, there was no online product which could deliver high quality content curating capabilities. Sensing the gap in the market, he moved to create a product to fulfil this need. Enter Mono, a reading application, whose name is inspired by Monocle magazine that Yu loves. Version 1.0 has just been released on the App Store with an Android version slated for release shortly. Thus far, the team has received angel investment from China Renaissance K2 Ventures and Bertelsmann Digital Media Investments (BDMI). When reading articles on Mono, users can like, comment, and republish them. Navigation on the application is fuss-free, users simply needing to scroll downwards to access more articles. As the phrase goes, “content is king”. Mono devotes much resources and attention to curating a variety of quality articles for users to peruse, collaborating with VICE, L7-Arts and other partners to present premium content. Every morning and night, between 25 and 30 articles on design, fashion and lifestyle are released for users to browse. The selection of content is not entirely left to algorithms. Instead of relying on data and user-generated content to find content, the editorial team also inspects and refines suggested articles. The top 30% of stories with the most clicks are first gathered and the editorial team will then narrow and refine the choices based on the editorial direction. Mono also pays attention to the variety of content available on its applications. Users can find interesting articles on topics from Japanese food to pressure cookers, games to videos. The choice of such content, according to Yu, is to expose readers to different and unfamiliar categories of information that are not readily available, so as to expand their knowledge about the world. Besides curating articles from its collaborators, Mono also includes other types of content to enhance its value to users. For example, the team has also included Greedy Snake, a game that it created, short music videos and other video clips between three to five minutes long, in its content mix. These additions will pop up as the users continue exploring the application, to give users a surprise and a pleasant break. Another feature of Mono is the synergy between page design with what the user is reading at that moment. For example, if the user is reading an article that mentions a black hole and scrolls further down to read, he or she will be brought into a space with a photo of a black hole or other related information. Mono is currently in its 1.0 version. It envisions that version 1.5 will allow previously recommended content to be available to users who have later downloaded the application. In version 2.0, Mono will offer personalized content to its users. In Yu’s opinion, there are many excellent news applications but good content curation applications, whether personalized or aggregated, are still lacking. A lot of high quality content is still buried and waiting to be excavated. Such a problem is something that the print magazine industry had faced earlier. Mono’s goal is to bring excellent content to the fore and to create an excellent reading experience via users, content and the application. Yu added that Mono plays an important role in building awareness of great content that would otherwise have been hidden because of limited publicity and marketing. He also hopes to collaborate with traditional media, in a second round of content dissemination. 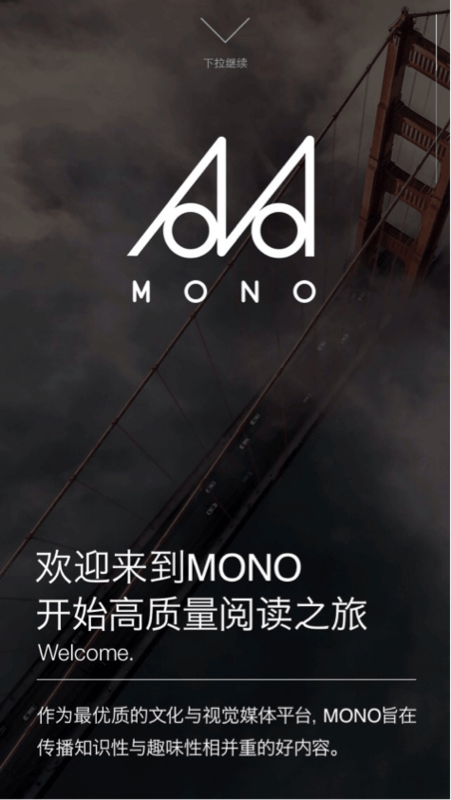 As for its business model, Mono is still looking to advertisements as its revenue source. In particular, it is seeking to collaborate with advertisers with regard to the contents of their advertisements. In Yu’s opinion, it is not that users do not like looking at advertisements but that advertisements are not attractive enough. He suggested that if there could be a collection of Coca Cola advertisements for users to browse, it would be an enjoyable experience for users. Presenting ads as high quality content is a goal that many reading applications aspire to reach, such as Jin Ri Tou Tiao in China or the widely-used Flipboard in the U.S. To successfully execute this is difficult. Developers have tried to include videos into the content mix but ensuring that these new additions do not undermine the reading experience is tricky. To Yu however, this is something that can be solved, as long as one does not give up trying.